Asif, the owner/manager, has stylishly and tastefully decorated his restaurant to a very high standard. You will experience a warm welcome from Asif and will enjoy your meal in very comfortable surroundings. Asif, who has 20 years experience of operating quality Indian restaurants, places great emphasis on selecting the finest ingredients and ensures that all dishes are freshly prepared to order. The well-balanced menu offers a range of dishes to suit all tastes including a vegetarian selection and chef’s specialities. Open every day 12-2.30pm and 6-midnight. All major credit cards accepted (not Amex). No service charge. 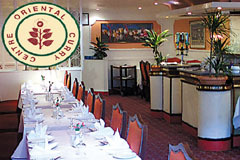 The Oriental Curry Centre is happy to prepare any dish of your choice which is not included in the menu. Authentic Indian cuisine with a range of Tandoori, Balti, Seafood, Meat and Poultry dishes.